The magnificent Shire horse is best known for its height and strength, holding records for being the strongest, largest horse in the world. In the days before machinery became the workhorse of agriculture and industry, the Shire was well known for its immense pulling power. Now that the horsepower of draft horses is no longer required, the Shire has landed on the lists of endangered livestock breeds in the U.K., U.S., and Canada. In fact, it is estimated that fewer than 100 Shire horses remain in Canada, and the breed is on the critical list of the American Livestock Breeds Conservancy. Shires are named for the shires of the countryside where the breed was developed. It is widely believed that the British "Great Horse," which was used in battle, was the ancestor of the Shire. The descendants of the Great Horse are thought to have been outcrossed with Friesians and other breeds and developed as the Old English Black Horse. The Packington Blind Horse, a stallion who lived in the late 1170s, is regarded as a foundation sire of the Shire horse breed. The Shire Horse Society, first called the English Cart Horse Society, was formed in 1878. The Shire was brought to the U.S. around 1853 but never attained much popularity. Instead, Shires were used primarily to breed increased size into smaller farm horse stock. Confusing the Shire horse with the Clydesdale would be easy. The head is longer and narrower in profile than that of the Clydesdale, however, with a smaller cheekbone. The nose is slightly Roman. The neck is long and arched, with a high set. The back is short, and the shoulders and chest are powerful and muscular. The hindquarters are not quite as bulky as those of a Clydesdale, but they're still powerful and well-muscled. Overall, the Shire horse has a commanding and powerful presence—the kind of majestic, muscular steed you'd imagine in a medieval painting. The Shire horse is the tallest of all horse breeds, standing at an average 17.1 hands high. The breed standard requires individuals to be at least 16.2 hands high, and stallions can be up to 17.2 hands high. For many years, until his death in 2001, a Shire gelding named Goliath was the Guinness Book of World Records recordholder for the world's tallest horse. He stood at more than 19 hands high. The world’s largest horse of all time might have been a Shire named Mammoth, born in 1848. He stood 21.2 hands high and weighed an estimated 3,300 pounds. On average, the Shire horse lives about 28 years. The Shire horse was used extensively to pull carts of ale from breweries to public houses. Before World War I, these gentle giants commonly served as farm horses, pulling wagons and working agricultural fields. When coal was a major source of heat and light, Shires were employed to pull enormous coal wagons over the rough roads. Today, the Shire is still popular for pulling vehicles such as sightseeing wagons, and many equestrians enjoy riding the gentle breed for pleasure. They are an environmentally friendly alternative to tractors on small farms and are still used in logging operations. Lastly, but perhaps most visibly, they are a popular promotional tool for modern-day beer brewers, some of whom are again making deliveries by horse and wagon. Shire horses come in black, bay, gray, and chestnut or sorrel, although the U.K. breed standard does not allow chestnut colors. Likewise, according to the American breed standard, "roans and excessive white markings are undesirable." The most outstanding characteristics of the Shire horse, of course, are its imposing height and extreme strength, traits documented both in record books and anecdotally. For example, a pair of Shires in the 1920s pulled a load of more than 45 tons. The exact weight of the load could not be determined, however, because the weight exceeded the scale's capacity. Although the Shire's size can be intimidating, the breed is well-known for its easygoing temperament. This horse does not spook easily. Like Clydesdales, Shire horses have distinctive feathering—long strands of hair—below the knees and hocks. This feathering should be fine, silky, and not overly thick. The hooves are massive, befitting the size of the body they must carry. Their temperaments are notable, too. They stand tall and proud, but delight humans with their friendly, peaceful demeanor. Great Britain's tallest horse is Duke, a shire who, as of 2008, stood at a regal 19.3 hands high (that's about 6 feet 5 inches), weighed about the same as a car, and was still growing. He eats about four times the amount average-sized horses consume and lives in a stable that was built especially for him (he can't fit into standard-sized stables). His blankets and other accessories are, of necessity, custom-made. Despite his size, though, his handlers say he is "as gentle as a lamb" and is very attached to a Shetland pony that lives on the same farm. One of the most famous Shires was the majestic Goliath, who died in 2001. Measured at more than 19.5 hands high, he was the tallest horse in Great Britain at the time and, for eight years, was listed in "The Guinness Book of World Records." In fact, the publication recognized him in 2000 as the tallest living horse in the world. A beautiful black horse renowned for his character, he was a member of a show horse team owned by the Young and Co. brewery. 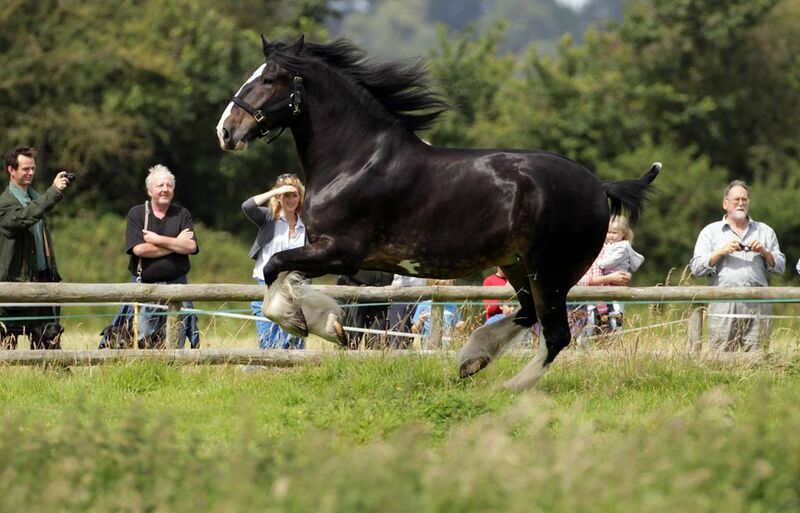 Is the Shire Horse Right for You? Shires may be big, but they're very calm. Although beginning riders might need a boost to climb aboard, they can be reasonably sure of a smooth ride. Shires rarely rear or buck, and they don't scare easily. They tolerate loud noises, vehicles, kids, water, horns, thunder, and even other animals such as dogs with aplomb and evenness. They are eager to please, so they're easy to train. This easygoing nature likely arose from the breed's original intended purpose: to carry men in heavy armor into loud, dangerous battle situations without flinching. A word about grooming: The beautiful feathering around the ankles requires regular brushing and cleaning to avoid a bacterial infection that causes painful, crusty scabbing. Commonly known as "dew poisoning," "mud fever," and "scratches," this condition can be avoided by keeping your Shire dry and treating any signs of infection promptly with antibiotics. Up on top, you'll likely need a sturdy stool to reach high enough to groom your Shire horse fully. A hoof pick will help you dig out debris and stones from your horse's very large hooves. A Shire is a rather expensive breed to keep, for a number of reasons. Because of its sheer size, it requires more feed than other breeds. Some vets recommend high-fat diets to ward off a condition that's common in Shires, which causes cramps in the hind leg quarters. Typically, owners must buy custom-made tack; mass-produced equipment simply won't fit. Lastly, these horses can command premium prices because of their relative rarity. In general, though, the Shire is a genial, sturdy breed that's ideal for anyone with the time and means to feed, house, and groom it.